Sit back and let this tech keep you healthy, happy, and safe. By 2022 there will be over 45 billion cameras in the world integrated into everything from our phones to our cars and our mirrors. These cameras will be capturing wide swaths of visual data – photos, videos, x-rays, radar, thermal images, etc. – and analyzing it via computer vision, machine learning, and artificial intelligence. Sound scary? It’s not, these visual technologies which are already part of our everyday life are on a trajectory to make a massive impact on how we live. Over the next five years these technologies will make us healthier, safer, and happier. Whether it is a doctor peering down your throat as you say “ahhh” or an MRI of your brain, visual assessment is critical to medical care. More and more of those assessments are being captured digitally and analyzed via computer vision and AI. A company named Ezra, for example, is making cancer screening more affordable, accurate, and non-invasive by detecting prostate cancer through full-body MRIs that are then analyzed by computer vision and AI. Visual technologies traverse a patient’s journey from diagnosis, to treatment, to continuing care and prevention. They are working to diagnose disease before symptoms appear, personalize treatment, assist surgeons, and make ongoing care more patient centric, affordable and efficient. Every area of medical practice – from physical therapy to dental care, is being improved with visual tech. “Visual technologies are essential to dental care, and computer vision is helping dentists diagnose issues earlier and more accurately,” says Dr. Kyle Stanley, Chief Clinical Officer at Pearl. 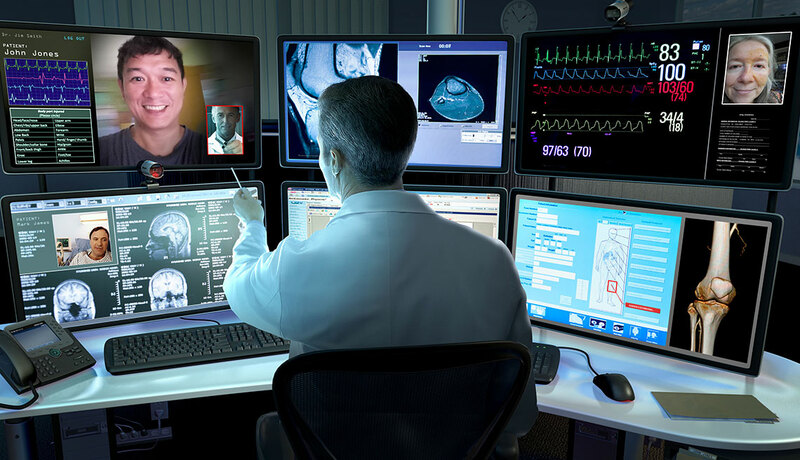 In a few years, we will be visiting the doctor more often from our living room rather than a crowded office and we will be healthier due to visual tech. This is already happening with many health insurance plans offering telemedicine options, which come in handy when your young child spikes a fever in the middle of the night. From security cameras to traffic cams, there are already millions of cameras dedicated to monitoring our safety. Now, visual technologies are evolving to make us safer in real time – not just sending that dangerous driver a ticket when they run a red light but stopping an oncoming car if it gets too close to you as you cross the street. Autonomous vehicles with cameras and smart visual sensors (LiDAR, RADAR, etc) are making us safer on the road but will also do so by sea, like Sea Machines, helping us avoid things like tragic oil spills and maritime collisions. Visual tech is being embedded in factory assembly lines to keep workers safer and ensure end products are safe for consumers. Visual sensors help robots lift and sort cargo at ports of entry, lessening the physical burden on workers and ensuring the chain of custody on your packages is maintained. Agriculture is an industry ripe for disruption by the tech industry. To feed the global population in a sustainable way and minimize the damage caused by soil erosion, chemically resistant weeds, dwindling water supplies, and more, farms large and small will be relying on technology to deliver higher quality and quantities of food. To combat ingesting harmful substances from our food, Impact Vision is working to establish higher standards and safer food for everyone. Visual technologies are also making us happier. Besides puppy videos, visual technologies are bringing smiles to our faces everyday by increasing ease, productivity, and interpersonal connection. Smart city initiatives, like We Cities, are tackling ease and productivity on a societal scale. Using visual tech to improve traffic and affordable housing makes it easier to navigate and live in our ever-growing metropolises. At the other end of the spectrum, Touchcast, is working to increase productivity at a team or even individual level by scaffolding the way we communicate, collaborate and learn with deep learning and AI. Companies like Synthesia are improving personal experience and connection through synthetic media, a visual tech that empowers storytellers to connect with their digital audience in their native language. Their platform translates video content to synchronise the lip movements of the actor. This results is a seamless experience for the viewer to watch in their own language. Visual technologies are making us happier by increasing ease and productivity within our daily lives. They deepen the connections between individuals and communities and provide greater experiences through highly personalized content. From facial recognition used to open your iPhone to the Amazon Echo Look or Facebook Portal you use to call your grandparents, visual technologies are already improving our lives. Over the next several years, cameras and visual sensors will be seamlessly embedded in more of the devices and tools we use on a daily basis and those visual technologies will help us become safer, healthier and happier.